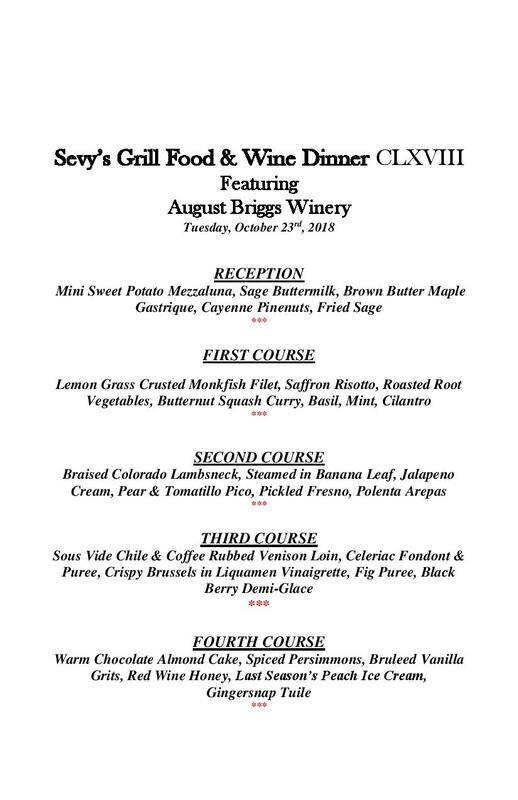 Join us Tuesday, October 23rd as we welcome one of our favorite wineries, August Briggs. Our special guest is Matt Gacso, National Sales Director and Owner, and he will be sharing his insight and experience in running this Napa Valley boutique winery. Known for producing limited quantities of great vintages from carefully selected vineyards across Napa and Sonoma counties, this will be an opportunity to taste some special wines - and Chef Eric has created an amazing menu to compliment each. Amuse bouche and wine reception begins at 6:30, followed by a four course dinner with paired wines, $95 per guest (plus tax and gratuity). Reservations are already starting to fill, so make yours now for this evening with a winery owner! Wines to be paired soon!